A numerical method is proposed to solve the coupled flow and transport problems in adjacent surface and subsurface regions. The flow problem is characterized by the Navier–Stokes (or Stokes) equations coupled by Darcy equations. In the subsurface, the diffusion coefficient of the transport equation depends on the velocity field in a nonlinear manner. The interior penalty discontinuous Galerkin method is used for the spatial discretization, and the backward Euler technique for the time integration. Convergence of the scheme is theoretically derived. Numerical examples show the robustness of the method for heterogeneous and fractured porous media. The author acknowledges the support of National Science Foundation through the grant DMS 0810422. C. Geuzaine and J.-F. Remacle. Gmsh: a three-dimensional finite element mesh generator with built-in pre- and post-processing facilities. 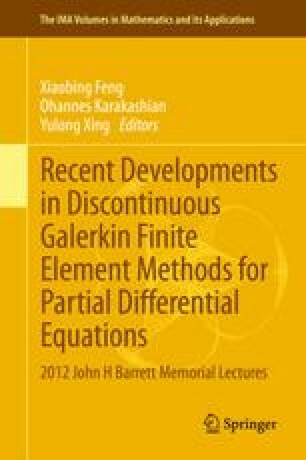 International Journal for Numerical Methods in Engineering, 79:1309–1331, 2009. http://www.geuz.org/gmsh/.